1. Poach the salmon in boiling water for 8 minutes until just cooked. Allow to cool slightly. 2. Meanwhile, heat the oil in a frying pan and fry the tomatoes and salad onions for 2-3 minutes, then add the spinach until wilted. Heat the lentil pouch according to pack instructions and add to the pan. Stir in the vinaigrette and mix. 3. 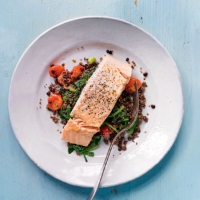 Spoon some warm salad onto a plate, top with the salmon and serve.